Do we understand the meaning of the Bible with the help of Holy Spirit? 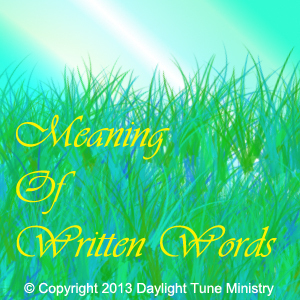 Suddenly, “meaning of writing” produces the acronym of MOW. But an additional word was added when I revisited this again. Posted in Acrostic, Poetry and tagged Christ, Creator, God, help, Holy, Immanuel, Jesus, Lord, Meaning, Messiah, Mow, Purpose, Son, Spirit. Bookmark the permalink. 1. To move through water by means of the limbs, fins, or tail. 2. To move as though gliding through water. 3. To float on water or another liquid. 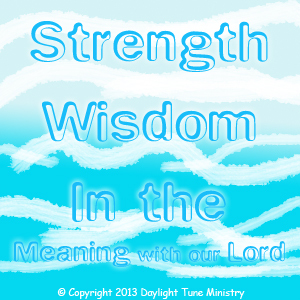 In God, we find meaning in Him then His strength and wisdom comfort us as we walk in His will. Posted in Acrostic, Poetry and tagged Bible, Faith, Father, God, Holy, Jesus Christ, Lord, Meaning, Purpose, Scripture, Son, Spirit, Strength, Swim, Wisdom. Bookmark the permalink.